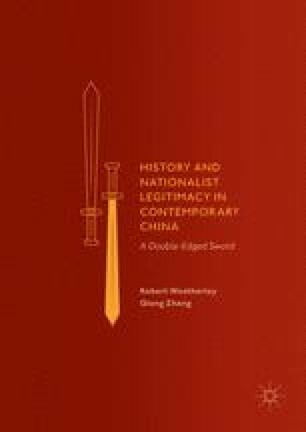 This chapter provides the first of our two case studies on consensual nationalism, examining the party’s recognition of the KMT’s key role in the Second Sino-Japanese War. Previously, stringent political controls were noticeably relaxed during 2005 to mark the 50th anniversary of the end of the war. This gave rise to an upsurge in investigative journalism and internet activity which highlighted the true role of the KMT during the war. The CCP’s underlying objective has been to promote itself as the party of national unity, but the public response has not always been supportive of the CCP. This has seen widespread anger over the CCP mistreatment of KMT veterans after the war and accusations of an historical cover-up over the KMT’s key contribution in defeating Japan and the CCP’s lack thereof. BBC. (2015, November 5). South China sea: US defence chief Ash Carter Wades into row. Retrieved from http://www.bbc.co.uk/news/world-asia-34737051. BJRB. (2008, December 15). Zhengque Lijie Mao Zedong Pinglun Riben de Yijuhua [The correct understanding of a remark made by Mao Zedong on Japan]. Beijing Ribao [Beijing Daily]. Retrieved from http://www.bjd.com.cn/gdjc/200812/t20081215_495586.htm. Cheng, X. (2010, September 11). Xiedu Lishi de Ren zhong Jiang Hui bei Lishi Tuoqi [Those who abuse history will eventually be forsaken by history]. Zhongguo Xuanju yu Zhili [China Elections and Governance]. Retrieved from http://www.chinaelections.org/NewsInfo.asp?NewsID=186779. China Boom Project. (2011, July 16). The legacy of property provides stability. Retrieved from http://chinaboom.asiasociety.org/period/emancipation/0/110. China Post. (2010, September 5). Ma stresses ROC’s role in victory over Japan. Retrieved from http://www.chinapost.com.tw/taiwan/national/national-news/2010/09/05/271398/Ma-stresses.htm. CQCB. (2005, July 5). Kangri Laobing Yang Yangzheng Chongfan Laozhanchang Shanghai Sihang Cangku [Anti-Japanese veteran Yang Yangzheng returns to the old battlefield at the Shanghai Sihang warehouse]. Chongqing Chenbao [Chongqing Morning News]. Retrieved from http://news.163.com/05/0705/08/1NSS96I60001127G.html. CQWB. (2010, December 17). Babai Zhuangshi Zuihou Laobing Yang Yangzheng Zou le [Yang Yangzheng, the last of the eight hundred heroes, passed away yesterday]. Chongqing Wanbao [Chongqing Evening News]. Retrieved from http://www.cqwb.com.cn/NewsFiles/201012/17/20100017120000412114.shtml. Epoch Times. (2011, February 2). Last Chinese war hero suffers destitution and insult. Retrieved from http://www.theepochtimes.com/n3/1502745-last-chinese-war-hero-suffers-destitution-and-insult/full/. FHW. (2007, June 19). Fenghuang Dujia: Lengnuan Rensheng zhi “Laobing bu Si” shang [Phoenix TV exclusive: Life story tale of ‘Old soldiers never die’]. Fenghuang Wang [Phoenix TV Network]. Retrieved from http://phtv.ifeng.com/phinfo/200706/0614_45_135240.shtml. Global Times. (2014, September 14). As KMT veterans receive newfound respect, others gauge political winds. Retrieved from http://www.globaltimes.cn/content/881379.shtml. GZRB. (2010, August 18). Laobing Shipin Gandong Wangluo [Video of a veteran moves internet users]. Guangzhou Ribao [Guangzhou Daily]. Retrieved from http://gzdaily.dayoo.com/html/2010-08/18/content_1072442.htm. Haonian, X. (1999). Shui shi Xin Zhongguo [Which is the new China]. Blue Sky Publishing House. Retrieved from http://www.huanghuagang.org/newchina/index-eNewChina.html. HQSB. (2015). You Hei Zhonggong! Ke Ni Dei Duo mei Naozi Cai Hui Xin Zhege Yaoyan a? [Vilifying the CCP again! But how brainless must you be to believe in this rumour?]. Huanqiu Shibao [Times]. Retrieved from http://www.weibo.com/1974576991/CpI1ujKTV. HQWG. (2015, July 14). Cong Yize Songren Tingwen de Yaoyan Shuoqi [About a sensational rumour]. Hongqi Wengao [Red Flag Manuscripts]. Retrieved from http://www.qstheory.cn/dukan/hqwg/2015-07/24/c_1116028754.htm. JFJB. (2015, September 11). Shengli Ri, Wangluo Zheng Nengliang Ye Shoudao Jianyue [On victory day, online positive energy also under inspection]. Jiefangjun Bao [People’s Liberation Army Daily]. Retrieved from http://www.81.cn/jmywyl/2015-09/11/content_6676456.htm. LHB. (2008, December 22). Ba Niu Yiyu Guojun Huangzhong Qiangu Ku [Over 1,000 desolate tombs of nationalist soldiers found in the foreign land of Papua New Guinea]. Lianhe Bao [United Daily News]. Retrieved from http://mag.udn.com/mag/world/storypage.jsp?f_ART_ID=182327. LHB. (2009a, February 6). Dalu Wangyou Ni Fu Ba Niu, Ying Kangri Zhanshi Yihai [Mainland netizens plan to go to Papua New Guinea to retrieve remains of anti-Japanese soldiers]. Lianhe Bao [United Daily News]. Retrieved from http://mag.udn.com/mag/world/storypage.jsp?f_ART_ID=182335&pno=7. LHB. (2009b, March 8). Ba Niu Guojun Yingling, Hun Gui Zhonglieci [Papua New Guinea national army soldiers’ souls enshrined in martyrs’ shrine]. Lianhe Bao [United Daily News]. Retrieved from http://mag.udn.com/mag/world/storypage.jsp?f_MAIN_ID=409&f_SUB_ID=4051&f_ART_ID=182325. Mao, Y. (2011, May 3). Ba Mao Zedong Huanyuan Cheng Ren: Du ‘Hong Taiyang de Yunluo’ [Restore Mao Zedong as a human being: A review of the ‘Fall of the Red Sun’]. Zhongguo Baodao Zhoukan [China Report Weekly]. Retrieved from http://www.china-week.com/html/5972.htm. NFDB. (2005, September 1). Yichang Qiangjiu Jiyi de Meiti Yundong: Gaomidu Huanyuan Kangzhan Lishi [A media movement to rescue memories: Intensively restoring the history of the war of resistance]. Nanfang Dushibao [Southern Metropolis Daily]. Retrieved from http://news.sina.com.cn/c/2005-09-01/09566837675s.shtml. NFDB. (2007, November 7). Nandu Tuichu “Xunfang Kangzhan Laobing” Shuxie Laobing Chuanqi [Southern metropolis daily publishes ‘Finding veterans from war of resistance series’, Penning the legends of veterans]. Nanfang Dushibao [Southern Metropolis Daily]. Retrieved from http://nd.oeeee.com/special/book/comment/200711/t20071107_602217.shtml. Ran, Y. (2010, September 19). Qirong “Guoshang” Qingshi Jin Cheng Hui? [How can the history of the ‘National martyrs’ be allowed to turn into dust?]. Yazhou Zhoukan [Asia Weekly]. Retrieved from http://www.yzzk.com/cfm/Content_Archive.cfm?Channel=tt&Path=2254381392/37tt1.cfm. RMRB. (2010, September 3). Mingji Lishi, Kaichuang Weilai - Jinian Zhongguo Renmin Kangri Zhanzheng ji Shijie Fan-Faxisi Zhanzheng Liushiwu Zhounian [Remember the history, open up the future - commemorating the 65th anniversary of the victory of the war of resistance against Japan by the Chinese people and the world anti-fascist war]. Renmin Ribao [People’s Daily]. Retrieved from http://opinion.people.com.cn/GB/40604/12621793.html. RMRB. (2014, September 4). Zai Jinian Zhongguo Renmin Kangri Zhanzheng ji Shijie Fan-Faxisi Zhanzheng Shengli 69 Zhounian Zuotanhui shang de Jianghua, 2014 Nian 9 Yue 3 Ri [Speech at seminar marking the 69th anniversary of the victory of the war of resistance against Japan by the Chinese people and the world anti-fascist war, 3 September, 2014]. Renmin Ribao [People’s Daily]. Retrieved from http://cpc.people.com.cn/n/2014/0904/c64094-25599907.html. RMRB. (2015, May 29). Waiguoren Yanli de Zhongguo Kangzhan: Zhongguo Kangzhan Gongji Juda er Dute - Fang Niujin Daxue Lishi Jiaoshou Lana Mite [China’s resistance war in a foreigner’s eyes: China’s achievements in the resistance war are huge and unique - An interview with Oxford university history professor Rana Mitter]. Renmin Ribao [People’s Daily]. Retrieved from http://dangshi.people.com.cn/n/2015/0529/c85037-27074882.html. RMW. (2005, 20 April). Kangri Jiangling Xie Jinyuan [Anti-Japanese general Xie Jinyuan]. Renmin Wang [People’s Network]. Retrieved from http://politics.people.com.cn/GB/8198/46867/46884/3336338.html. RMW. (2010a, August 18). Renmin Shiping: Tantan dui Guomindang Junguan Wu Dehou de Baodao [On the media coverage of KMT officer Wu Dehou]. Renmin Wang [People’s Network]. Retrieved from http://sn.people.com.cn/GB/190202/190236/12474874.html. RMW. (2010b, September 3). Mingji Lishi, Kaichuang Weilai: Jinian Zhongguo Renmin Kangri Zhanzheng Ji Shijie Fan Fanxisi Zhanzheng Shengli Liushiwu Zhounian [Remember history, open up the future: Commemorating the 65th anniversary of the victory of the war of resistance against Japan by the Chinese people and the world anti-fascist war]. Renmin Wang [People’s Network]. Retrieved from http://opinion.people.com.cn/GB/40604/12621793.html. Taipei Times. (2015, August 31). Lien flies to China amid controversy. Retrieved from http://www.taipeitimes.com/News/front/archives/2015/08/31/2003626584/2. WDZ. (2011, February 25). ‘Zhongjian Didai’ de Geming Gaosu Ni: Zhonggong Heyi Bisheng? [Revolution in the ‘Intermediate zone’ tells you: Why was the CCP bound to be victorious?]. Wenhui Book Review [Wenhui Dushu Zhoubao]. Retrieved from http://dszb.whdszb.com/whdszb/html/2011-02/25/content_76243.htm. WZX. (2010, September 3). Kangri Zhanzheng de Lishi bu Rong Cuangai [The history of the war against Japan brooks no falsification]. Wuyou Zhi Xiang [Utopia]. Retrieved from http://www.wyzxsx.com/Article/Class14/201009/177109.html. XHW. (2010, May 20). Er Zhan Laobing Houdai Qicheng Chongzou “Zhongguo Yuanzhengjun Zhi Lu” [Offspring of world war two veterans begin walking the ‘Path of the Chinese expeditionary force’]. Xinhua Wang [Xinhua Network]. Retrieved from http://news.xinhuanet.com/2010-05/20/c_12124738.htm. Xie, Y. (2002). Zhonggong Zhuangda Zhimi: Bei Yangai de Zhongguo Kangri Zhanzheng Zhenxiang [The mystery over the rise of the CCP: The concealed truth of China’s war of resistance against Japan]. Mirror Books. Retrieved from http://blog.dwnews.com/post-144134.html. Xinhuanet. (2005, September 3). Speech at a meeting marking the 60th anniversary of the victory of the Chinese people’s war of resistance against Japanese aggression and the world anti-fascist war. Retrieved from http://news.xinhuanet.com/english/2005-09/03/content_3438224.htm. Xinhuanet. (2015, September 1). Xi stresses Mainland-Taiwan unity for war anniversary. Retrieved from http://news.xinhuanet.com/english/2015-09/01/c_134577112.htm. XSZK. (2011, April 11). Rang Kangzhan Laobing bu Zai Liulei [Let the resistance war veterans shed no more tears]. Xinshiji Zhoukan [Century Weekly]. Retrieved from http://magazine.caing.com/2011-04-08/100246206.html. Xu, Y. (2010, March 26). Xu Yan Shaojiang: Wang Shang Dui Guomindang Kangzhan You Zhongduo bu shi Chuixu [Colonel Xu Yan: There is a lot of untrue praise for the KMT’s wartime performance]. Renmin Wang [People’s Network]. Retrieved from http://military.people.com.cn/GB/1076/52984/11227767.html. YCWB. (2011, January 22). Women bu Pa Siwang, Women Pa bei Yiwang - Guilai de Zhuangshi Yang Genkui [We are not afraid of death, we are afraid of being forgotten - returning hero Yang Genkui]. Yangcheng Wanbao [Yangcheng Evening Daily]. Retrieved from http://www.ycwb.com/epaper/ycwb/html/2011-01/22/content_1024559.htm. YZZK. (2005a, August 28). Zhonggong Jinian Kangzhan Guojun Huo Kending [The CCP’s commemoration of the nationalist army’s war effort recognised]. Yazhou Zhoukan [Asia Weekly]. Retrieved from http://www.yzzk.com/cfm/Content_Archive.cfm?Channel=ae&Path=2268386452/35ae4.cfm. YZZK. (2005b, August 28). Wei Jiang Jieshi Pingfan, Zhonggong Kangzhan Shiguan Weimiao Bianhua [Chiang Kai-shek rehabilitated, subtle changes in the CCP’s view of second world war history]. Yazhou Zhoukan, [Asia Weekly]. Retrieved from http://www.yzzk.com/cfm/Content_Archive.cfm?Channel=ac&Path=2268386452/35ae1a.cfm. ZQB. (2010, September 8). Laobing Guilai [The veteran returns]. Zhongguo Qingnian Bao [China Youth Daily]. Retrieved from http://zqb.cyol.com/content/2010-09/08/content_3408656.htm. ZXW. (2010, September 11). Cui Yongyuan Chengqing ‘Wo de Kangzhan’ Tou 130 million Yuan Chen Mei Xiang Shouhui Chengben [Yongyuan clarifies that investment for ‘My war of resistance’ was 130 million yuan, says he did not intend to recoup the costs]. Zhongguo Xinwen Wang [China News Network]. Retrieved from http://www.chinanews.com/yl/2010/09-11/2527046.shtml.